1. 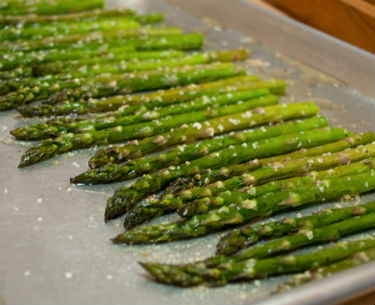 Keep the trimmed asparagus in a large roasting pan. 3. Sprinkle salt and pepper. 4. Toss well to coat the asparagus. 5. Place the pan in a preheated oven at 450F for 5 to 6 minutes until tender and lightly browned. 6. Remove and keep aside to cool. Feel free to comment or share your thoughts on this Roasted Asparagus Recipe from Awesome Cuisine.